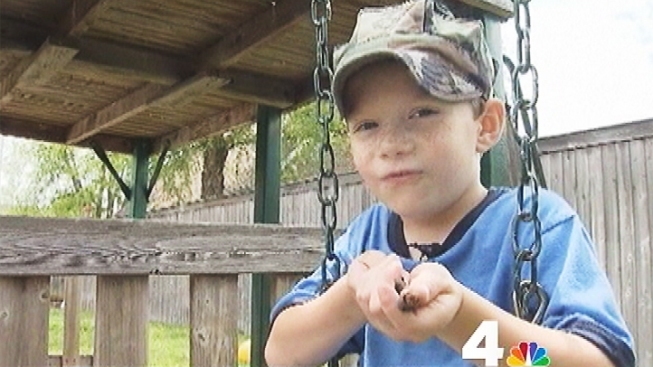 A 7-year-old boy was suspended for pointing his finger like a gun. A seven-year-old Virginia boy was suspended for pretending a pencil was a gun at his Suffolk school. Christopher Marshall apologized for the incident, but the school has a zero tolerance policy when it comes to weapons or threats of weapons. The boy's father is furious. "Enough is enough. I mean, where will we draw the line?" said Paul Marshall. " I mean, a pencil. Was it sharpened? Was it not? Was it a No. 2? What's the big deal?" The school said that they stand by their policy. "A pencil is a weapon when it is pointed at someone in a threatening way and gun noises are made," said Bethanne Bradshaw of Suffolk Public Schools. The suspension follows others in the D.C. metro area that have been protested by parents. In March, a 7-year-old Maryland boy was suspended for nibbling a breakfast pastry into the shape of a gun. In January, a Maryland boy was suspended for a day for pointing his fingers into the shape of a gun and saying "Pow!" while playing. That event was later taken off his school record.